Our favorite way to say those three little words? With woodcarving, of course! 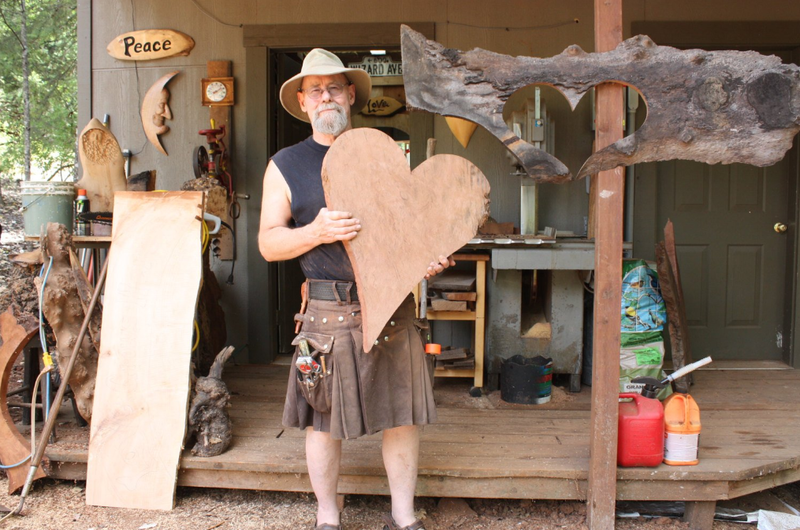 Wooden heart expert, Gary Burns aka the Tree Wiz, has been power carving for more than 5 decades. Most notable for his signature heart carvings, Gary uses his creative talents to turn a single piece of wood and into intricate carvings. Gary turned to woodcarving as a source of full-time income, after getting laid off in from an electronic manufacturing company in the ’70s. 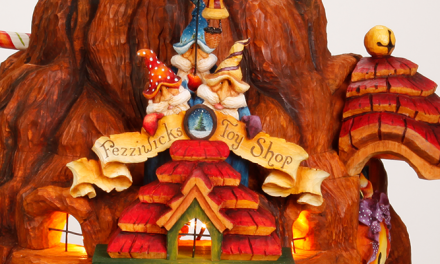 He opened his successful business, the Tree Wizard Gallery, in 1978. Now residing in Port Orford, Oregon, Gary sells his artwork on Etsy, Facebook, and at his gallery. 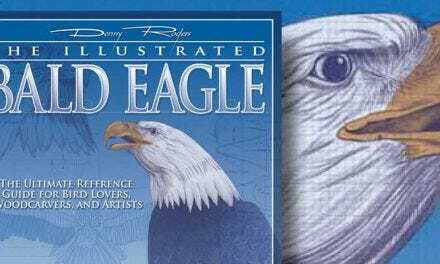 His work is well known in the Port Orford area from donating his artwork to many local fundraisers. Check out our interview with this Oregon artisan below. 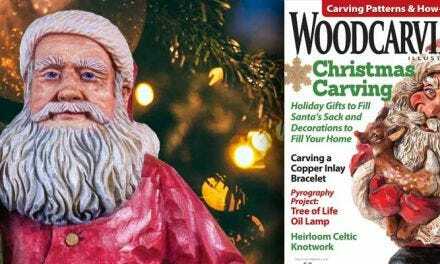 The Spring 2019 issue of the world’s best how-to magazine for woodcarvers is packed with patterns, techniques, tips and projects for all skill levels. This wildlife-themed issue dishes up a whole menagerie of creatures to keep you busy during the chilly months. Six pages are devoted to detailed instructions and techniques for power carving Lori Andrews’ bear head featured on the cover. 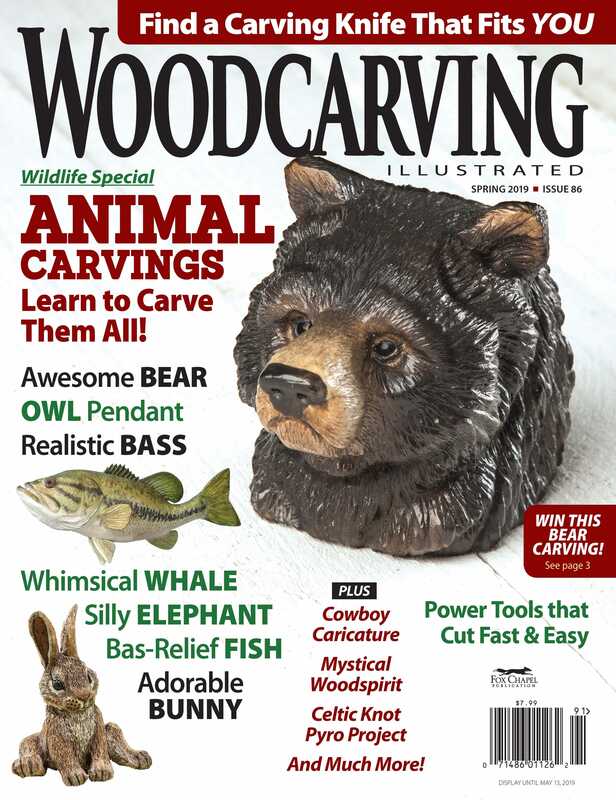 From Desiree Hajny’s bunny rabbit to Charles Weiss’ realistic largemouth bass, this issue is packed with animals just waiting to be carved. For comic relief, Frank Napoli and Mike Bloomquist have clever animal caricatures will make you smile. Beginners will enjoy making Massimo Assumma’s Creature of the Night pendant, and the classic caricature carvers will love Chris Hammock’s Windy the Cowboy. There are technique discussions in abundance, along with a feature on Maine’s Master Craftsman, John Bryan. 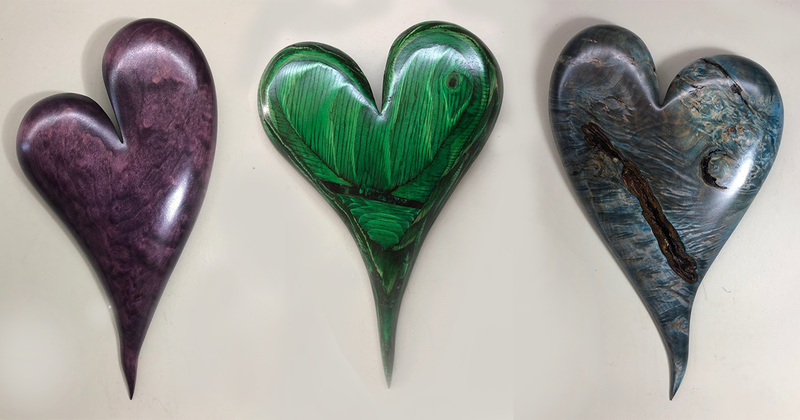 What inspires you to carve your subjects – specifically hearts? I love wizards in fantasy stories, the dark coziness of the woods, the creatures that live in them, to wake up in the morning and take a deep breath, to look out over the woods, or to go down to my shop in the woods. Love and hearts represent that for me. And to make fun things that tickle my soul. Ah, Life is Grand. About 10 years ago a customer ordered a heart. After completing it, I realized that I really enjoyed carving it. My motto has been love and gratitude. So the heart is a great symbol for my philosophy. I am still evolving my heart designs. Hearts are much easier for me to carve now as the fingers in my right hand are a bit compromised from years of using a Dremel. For my current carvings, I use a chainsaw, angle grinder, sander, the main carving tools. 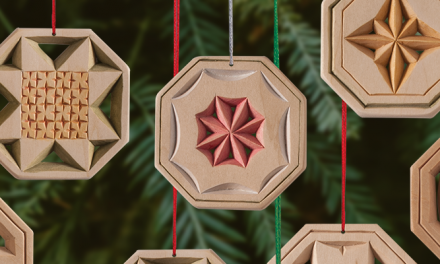 What lead you to specifically power carving over traditional hand-carving techniques? I wanted to make handmade gifts for Christmas presents. Being in college at the time, I did not have a lot of money. I saw an ad for a jigsaw in a mail order flyer, bought a $1.99 set of chisels, and found a Dremel tool at a hardware store. I never took a wood shop course so I didn’t even know that the chiseled needed sharpened! Later on, I found a real tool shop where I purchased my first professional tool, a Bosch jig saw. It set a standard for me as far as tools were concerned. I finally knew what a real power tool could do and one thing led to another. 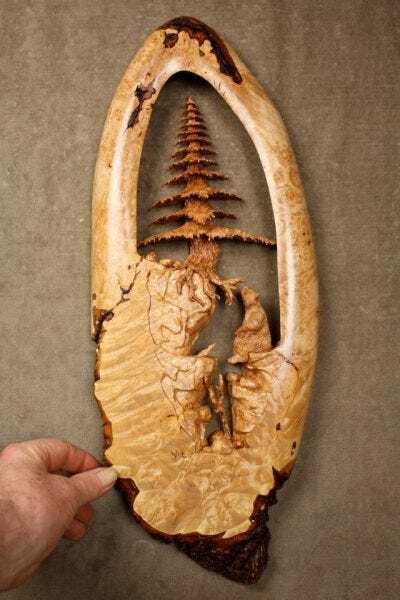 The wood that I love to carve is pine knots from the Ponderosa and Jeffery Pines. Other pines do not have good knots. They are amazing to carve faces and fish in. I have worked with Big Leaf Maple the most, especially Maple Burl. It is the softer of all of the Maple grains. I moved into Curly Grain and Quilted Grain Maple for the hearts but now that I live on the Oregon Coast, I use a lot of Myrtle Wood. For a beginner, what power carvers/tools would you suggest? With the right bits, a Dremel can be an amazing beginner tool. The model 100 is a good place to start but if you have the money to invest, I recommend the Dremel 4000 with the flex shaft. It has a very good variable speed switch and a lot of power. A Bosch jigsaw is an incredible tool for cutting things out. What’s your heart carving process? To carve a heart, I choose a nice dry piece of wood. I grind the mill marks off with an angle grinder and draw the shape of the heart. I probably use an eraser as much as I use a pencil when I am designing! Once the shape is drawn, I cut it out with my Bosch jigsaw and then use one of the orange carbide 4″ wheels on an angle grinder. After grinding, I use an angle grinder with a 5″ resin bond 50 grit disc to take the carbide disc marks off. Then I use a belt sander on the front and back with 120 grit. I use the Makita 21″ by 1 1/8″ belt sander on the curved portions with 120 grit as well. Then I use a Port Cable random orbit sander with 180 grit to take the 120 grit belt sander marks off and I then finish with 220 grit. To add color, I use Keda liquid dyes with denatured alcohol. Once dry, I finish with Ace Premium Enamel spray. The enamel is glossy so I finish with a coat or two of Deft Satin Lacquer. I use a hair dryer to dry each coat. I screw a sawtooth self-leveling hanger on the back for hanging. My motto has been love and gratitude. So the heart is a great symbol for my philosophy. What advice would you give someone that is interested in starting a wood carving business? You better like carving a lot. 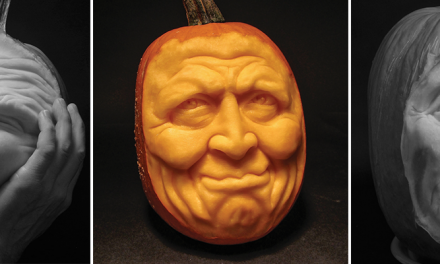 You are going to have to carve, and carve, and carve to be able to make a living at it. If you love it enough you just might pull it off, but it isn’t all about carving to make a living. It is about photography, promoting, learning shipping information, and building a customer base. 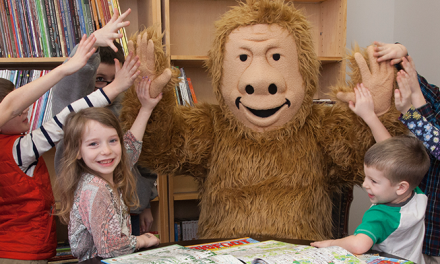 I work on building relationships with potential customers for commission work. Do you want to share any technique or tip for a beginner power carver? It’s a big help if you start holding a Dremel the proper way. I hold the tool like a pencil in my right hand. I lean my hand on what I am carving so that my pinky finger is connecting the Dremel to the piece of wood with my hand. Then I use my left thumb on the end of the Dremel with my left pinky finger braced on the wood being carved. You can push with your thumb or dig in with the fingers of your right hand. It can all work together in harmony with a little bit of practice. 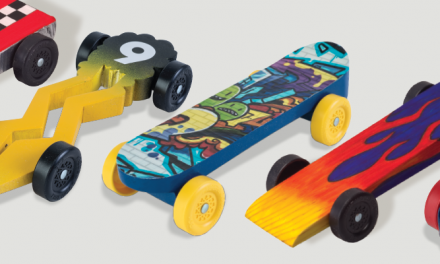 For more power carving tips and tricks, check out the Spring Woodcarving Illustrated Magazine.